Infra Pipe Solutions (IPS) is a leading manufacturer of large diameter High Density Polyethylene (HDPE) pipe and structures, known by the branded products: Sclairpipe® and Weholite®. Sclairpipe is a solid wall pressure pipe offering, chosen by municipal and industrial users for over (50) years for installation within potable, wastewater, irrigation and force main applications. Weholite pipe is one of the most economical solutions offered when large-diameter, low pressure or gravity piping is required for applications such as Combined Sewer Overflows (CSO's), Culverts, Sanitary Sewers and Power Penstocks. Weholite Structures and Fittings are manufactured and fabricated from Weholite. Buried or above ground, Weholite Structures are used for vaults, transitions and tanks while Weholite Fittings provide an endless array of connection and leak-free joining options for Weholite systems. IPS is a leading supplier of HDPE pipe for industrial, municipal and mining applications. IPS offers the largest pipe size range in the industry. Our extensive capabilities and multiple manufacturing facilities help us deliver great customer service through our quality products and customer support. Our Huntsville, ON facility has been producing HDPE pipe for over 50 years which has enabled our team to gain industry leading technical knowledge. Over the years, this has allowed us to offer Sclairpipe for pressure applications in sizes ranging from 3" to 63". We also manufacture the world leading profile wall Weholite pipe. Weholite is the ideal product for gravity feed and low pressure applications. 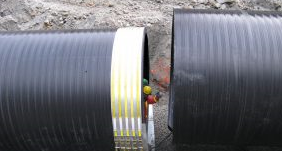 We offer the largest HDPE pipe in North America from 18" to 132" ID. The knowledge and expertise of our dedicated team allows us to create unique fabrication offerings with Weholite. IPS is the North American licensee for Weholite from Uponor Infra Oy.